Three miles south of the Las Vegas Strip, you’ll find the Adirondack lodge-themed Silverton Hotel and Casino Lodge, which is currently undergoing a five-year, $150 million expansion plan with recently completed guest-room renovations and additional restaurants and lounges. Silverton boasts 300 newly remodeled rooms and suites with pillow-top mattresses, leather sofas, hardwood furniture, Bath & Body Works products, high-speed Internet access, mini-bars and in-room movies. The sophisticated Twin Creeks Steakhouse serves generous portions at reasonable prices. The Shady Grove Lounge brings the great outdoors in with an Airstream trailer inside which you can watch plasma TVs, play Bowlingo or foosball, eat and drink. And the Mermaid Restaurant and Lounge, with its centerpiece 117,000-gallon saltwater tank filled with thousands of tropical fish and coral, and there’s also Seasons Buffet. Perhaps the most exciting addition, especially for outdoor enthusiasts, is the Bass Pro Shops Outdoor World, a 165,000-square-foot sportsman’s paradise featuring a NASCAR department, rods, reels and fishing accessories, hunting clothing and gear, an archery department with a four-station archery range, a rifle tube and pistol range, camping, hiking, outdoor cooking and bird watching equipment, and boats – from big-water to small fishing, canoeing and kayaking vessels. The casino has over 1,500 slot, video poker and keno machines, as well as such table games as blackjack, craps, roulette and three-card poker. The expansion plan also includes a multiplex cinema, retail shops, timeshares and new hotel rooms. Shuttle service is available to and from the Strip. There’s always something exciting happening in Las Vegas. From nightly shows to special events honoring the top names in motorsports, outdoor adventure and cultural celebrations, you can experience it all when you vacation at Silverton Casino Lodge. The list of events is constantly changing and includes your favorite entertainers in country music, classic rock, R&B, Top 40 and much more. Located just blocks from the Las Vegas Strip, The Westin Las Vegas Hotel – Casino & Spa offers all of the personal and business amenities for which Westin hotels are known, but with a healthy dose of Vegas glitz. The intimate casino has over 150 slot machines – from 5 cents to $25 – and 6 table games, including blackjack, roulette and craps. The Savona Bistro Restaurant serves prime steak, fresh seafood and Mediterranean cuisine in a contemporary setting. Cozy Westin accommodations include more than 800 guest rooms featuring the hotel’s signature Heavenly Bed, a pillow-top mattress, down blanket, three crisp sheets, a comforter, duvet and five of the “best pillows in the business;” and the Heavenly Bath, a custom-designed Speakman shower with two heads with five adjustable jets and spray options. There’s also a coffeemaker, tasteful granite bathrooms with deluxe spa amenities, dual-line, cordless phones and high-speed Internet access (by request). You can unwind with a massage or body wrap in the Hibiscus Spa or de-stress in the Westin workout fitness center, which has LifeFitness and Precor equipment. Conveniently located near Nellis Air Force Base and the Las Vegas Motor Speedway, Siegel Slots and Suites offers fully furnished Las Vegas hotel rooms. Lucky Dragon Hotel & Casino is Las Vegas’ first casino resort designed from the ground up to create an authentic Asian cultural and gaming experience. The resort, located at the north end of the Las Vegas Strip, is scheduled to open late 2016. Features of the property include a nine-story hotel with 204 rooms, of which 24 are suites; 27,500 square feet of casino space with an emphasis on table games including Baccarat and Pai Gow as well as slots, a high limit gaming area known as the Emerald Room and a luxurious VIP gaming parlor; a pool designed to create an oasis garden escape for hotel guests; a spa with four treatment rooms including reflexology and acupuncture; an indoor-outdoor Tea Garden featuring an extensive list of tea curated by Las Vegas’ only tea sommelier; five Asian-inspired restaurant concepts; and staff and signage to accommodate guests from throughout Asia as well as English-speaking guests. North Las Vegas is the latest hot spot in Southern Nevada. One of the hottest spots in that area is the Cannery Casino and Hotel. Near Nellis Air Force Base and the popular Las Vegas Motor Speedway, the Cannery bills itself as a “resort destination.” It’s hard to argue with that – especially for those who’ve come for the races. This hotel has 200 rooms, an elegant palm-bordered pool and Jacuzzi and 24-hour room service. The casino level offers six restaurants and two bars with nightly live entertainment. As you might guess from the names of the bars – Pin-Ups Lounge and Victory’s Bar & Grill – the Cannery goes for a WWII-vintage canning factory atmosphere, from the extensive use of brick to the illustrations of ’40s models on the blackjack tables. The 75,000-square-foot gaming area offers over 1,650 slot and video poker machines and 20 table games. There are weekly blackjack tournaments and free gaming lessons on weekend mornings. The property recently open a brand new race and sports book, a poker room offering 2 tables including low- and medium-limit Texas Hold’em, Omaha and 7-Card Stud and a 288 seat bingo room. The signature restaurant is Waverly’s Steak House, showcasing dark wood tones and still-life paintings that give it the look of a ’40s-style plant manager’s office. There’s also the Cannery Row Buffet featuring BBQ lunch and dinner, Casa Cocina for Mexican and margaritas and the All-American, 24-hour Victory’s Cafe. Try Vino’s Italian Restorante and Deli for a taste of Italy in your own backyard. The Cannery also features Galaxy Luxury Movie Theaters with 16 screens, a large indoor/outdoor entertainment and exhibit venue that accommodates up to 3,000 people for concerts, festivals, motor sports exhibits and boxing matches. The Eastside Cannery is the second Cannery brand casino in Las Vegas. Complementing the North Las Vegas hotel, the Eastside Cannery stays true to its historic past. The most prominent feature of the property is the 16-story bronze hotel tower featuring an exposed structural and decorative element, topped by a saw tooth roofline making it an icon for the Las Vegas Valley. There is an abundance of visual references to the burgeoning industrial era with the use of brick and steel in different locations, along with cross-braced steel facades and heavy steel open trusses. Murals depicting building amenities in a fun and nostalgic way decorate the outer walls of the property. The inside of the Eastside Cannery Casino & Hotel is complementary to the building’s architectural design. Inside, guests are transported to the age of industry. Large open truss ceilings, exposed mechanical and over-scaled detailing is throughout the property. There are elements of the past intermixed with hi-tech. Within the new 16-story hotel tower, more than 300 guest rooms and suites feature floor to ceiling glass windows giving guests spectacular views of the mountains and the bright lights of the Las Vegas Strip. The oversized 450 square foot guest room decor and furnishings are reminiscent of the ongoing industrial theme of the property, but have a fresh 21st Century feel with wide screen plasma televisions in every room. Guests who book the corner window suites enjoy an exceptional view while soaking in their in-room spas in their 600 square foot surroundings. The five executive suites on the top floor include many amenities in their 900 square foot surroundings. There is also a Jacuzzi and a half-acre pool complete with cabanas on the property. For meeting planners, the Eastside Cannery Casino & Hotel has 20,000 square feet of ballroom and meeting space to service a variety of meeting and convention needs. The main ballroom is over 17,000 square feet, divisible into five rooms. There are two additional meeting rooms as well as two boardrooms off the main ballroom. Eastside Cannery’s 450 seat Bingo Room holds seven sessions daily every other hour beginning at 1pm. Fresh pastries are served daily in the morning session and complimentary beverage service is available at every session. The Pinups Bar depicts the saucy 1960’s pop art beauties with a new space age op art look. The zigzag ceiling murals depict life in the 1960’s with glimpses into the ever-changing future; from imagery of man entering outer space to families riding futuristic rockets. The Eastside Cannery artwork celebrates the evolution of industry and embraces the optimism of the ever-changing future. Modern, fun and luxurious, SLS Las Vegas Hotel & Casino at the north end of the Strip offers top-notch dining, daylife, nightlife and shopping options. From the moment guests arrive, they’ll enjoy checking in amid an atmosphere that’s both elegant and whimsical. SLS Las Vegas Hotel & Casino houses 1,612 stylish accommodations, ranging from chic rooms to opulent suites, in three distinct towers: the World Tower, the Story Tower and the Lux Tower. Standard room amenities include premium mattresses and linens, state-of-the-art alarm clocks and music systems, 55-inch flat-screen HD televisions and luxury showers. There are so many places for eating and entertainment at SLS Las Vegas Hotel & Casino that you’ll never be able to do them all in just one visit. During the day, there are two unique pool experiences. Foxtail Pool Club (open seasonally) is situated at the center of the resort on the ground level, and the hotel also boasts a rooftop pool. Featured among the several distinct nightlife experiences at SLS Las Vegas Hotel & Casino is Foxtail, which is connected to the pool and has a cosmopolitan, lounge-like ambiance that can transform into a high-energy club. The Sayers Club, considered among L.A.’s most exclusive live music venues, has a major presence at the resort too. You never know what amazing performer will turn up to play in the intimate space packed with leather-tufted sofas. Plus, drinks flow continuously at the Monkey Bar near the lobby and the Center Bar in the casino. You’ll be able to indulge in all kinds of culinary experiences at SLS Las Vegas Hotel & Casino as well. Among the restaurants showcased are Katsuya by Starck, Ku Noodle, Bazaar Meat by José Andrés, Umami Burger, Beer Garden & Sports Book, Northside Café, 800 Degrees Neapolitan Pizzeria and Cleo by Danny Elmaleh. In addition, you can grab a quick bite at The Perq. SLS Las Vegas Hotel & Casino has a 50,000-square-foot casino and a sports book run in partnership with William Hill. There’s a 24-hour business center, lots of flexible meeting space, retail shops and a health club filled with cardio and weight training equipment. And for those rare times when you find you do want to relax, AWAY Spa offers 10 treatment rooms (some have custom massage beds equipped with music therapy technology), a relaxation lounge, a couples massage suite, herbal steam rooms and oversized experience showers. The Southwest meets North Las Vegas at Santa Fe Station, a classy and cozy resort for the entire family with a bowling center, movie theaters, multiple dining options, a pool, a Western dance hall and more. Only 16 miles from the Las Vegas Strip and just off U.S. 95, Santa Fe Station’s rugged stone exterior stands in harmony with the natural beauty of the surrounding mountains. Designed with the nuances of an ancient Spanish villa, the hotel-casino features an interior of earthy tans, reds and browns, marble flooring, wrought-iron accents and ceilings accentuated with glass arches. A hacienda-style lobby replete with chandeliers and leather couches greets guests at check-in, while comfortable Southwest-inspired rooms offer amenities including pillow-top mattresses, Pay-Per-View movies, hair dryers, ironing set ups and wireless internet access. A favorite of locals and tourists alike, gamblers will enjoy the hotel’s expansive casino, which offers not only 2,700 slot and video poker games, but also 40 table games, a 488-seat bingo hall, a keno lounge, a race and sports book and a non-smoking poker room. Looking for 1-cent and 5-cent slots? You’ll find them at Santa Fe Station along with progressive favorites like Megabucks and Wheel of Fortune. With a wide variety of restaurants to choose from, no one will ever go hungry here. The Feast Buffet caters to tastes from around the world, with Mexican, Italian, Chinese and American dishes. The upscale Charcoal Room proves that fine dining isn’t limited to the Strip, boasting an extensive wine list, succulent steaks and fresh seafood. The Grand Café has a full menu of breakfast, lunch and dinner delights, while diners will enjoy guacamole prepared tableside at Cabo Mexican Restaurant. Entertainment can be found in the Chrome Showroom, including a variety of world music headliners as well as local bands.The resort’s newest hot spot is 4949 Lounge, a stunning bar with guest DJs on weekends and karaoke on Monday nights. A 16-screen movie theater and a 60-lane bowling alley round out the attractions, making Santa Fe Station the perfect hotel for a weekend retreat or a family adventure. And with two garages offering plenty of self-park and valet spaces, you’ll never have to worry about finding a spot for your car. The LINQ Hotel & Casino caters to visitors of all ages and attitudes. It’s not a stuffy, elite-style resort, but a modern and socially connected place. Wireless internet access is available in its rooms and throughout the property. Plus, guests will enjoy things like booking shows and making restaurant reservations with a concierge touchscreen option. Adjacent to The LINQ Promenade, the open-air shopping, dining and entertainment district anchored by the High Roller observation wheel, The LINQ Hotel & Casino boasts many amenities and a fun atmosphere that make it an important part of the center Strip. For instance, the entertainment offerings here are standouts. In the evening “Divas Las Vegas” starring Frank Marino is never a drag — even though all the performers are in drag. Mat Franco, winner of season nine of NBC’s “America’s Got Talent,” brings his astounding tricks to The LINQ Theater. In addition, guests can stroll out to The LINQ Promenade, where they’ll be able to see concerts or go bowling at Brooklyn Bowl. Once you’ve taken in all the entertainment that abounds, you can treat yourself to The LINQ Hotel & Casino’s ample dining choices. Chef Guy Fieri’s first Las Vegas restaurant, called Guy Fieri’s Vegas Kitchen & Bar, is located at the resort’s north entrance. For excellent south-of-the-border cuisine, check out Chayo Mexican Kitchen + Tequila Bar at the south entrance. Or for one of the best breakfasts you’ve ever had — as well as amazing burgers and salads for lunch and dinner — try the Hash House A Go Go. Several restaurants in The LINQ promenade are also sure to satisfy your appetite — like the Yard House, Flour & Barley, Off the Strip Bistro, Sprinkles Cupcakes, Haute Doggery, Tilted Kilt and more. Inside the resort’s welcoming casino are plenty of table games and more than 800 slot and video poker machines. You’ll also discover an action-packed race and sports book. Nightlife is great at The LINQ Hotel & Casino as well. This lobby bar 3535, named for the numerical part of the resort’s address, features unique martinis and cocktails made from premium infused spirits. TAG Sports Bar will quench your thirst with one of more than 300 different beers. In O’Sheas Casino, you’ll be pleased to find a cheap bar and a rollicking good time on the stage — or you may be challenged to a game of beer pong. Order a variety of frozen daiquiris at Fat Tuesday, get a handcrafted cocktail from a flair bartender at the Catalyst Bar or quench your thirst at the Purple Zebra Daiquiri Bar on The LINQ Promenade. When you finally retire for a good night’s sleep, you’ll appreciate The LINQ Hotel & Casino’s comfortable accommodations. There are 2,256 rooms and suites with pillow-top mattresses, charging stations with USB ports, 47-inch LED flat-screen TVs and rain shower heads. Guests also delight in floor-to-ceiling windows that showcase views of the High Roller, the Strip or the surrounding city. There is also a pool deck for adults only with two pools and a center bar that serves up a diverse selection of frozen drinks, draught beer and signature cocktails. Rounding out the amenities at The LINQ Hotel & Casino are the full service Spa at The LINQ, which offers facials, body treatments and massages, as well as a fitness center, a salon and a wedding chapel. 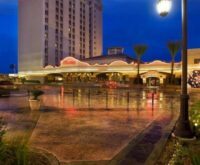 The Fiesta Rancho casino-hotel, comfortably located away from the frantic rush of the Las Vegas Strip and downtown, offers a pleasant, locals-friendly atmosphere along with the same excitement and amenities that distinguish Strip resorts. Of course, the Fiesta Rancho offers amenities that you won’t find on the Strip, most notably its NHL regulation-sized SoBe Ice Arena, which is available for public skating. Another standout feature of the Fiesta Rancho is its restaurant selection. The 600-seat Festival Buffet offers 11 food stations and a wide variety of cuisine spanning the globe from China to Italy and back. The food court offers a variety of fast food options. The Fiesta Rancho holds itself up as the “Official Royal Flush Capital of the World.” So, it makes sense that the resort’s 50,000-square-foot casino is not to be missed. After all, it had to earn that title somehow. A stay at The Cromwell is sure to be an unforgettable one. Located at the heart of the Las Vegas Strip on the northeast corner of Flamingo Road and Las Vegas Boulevard, the boutique-style resort has lots to offer travelers. Not only is The Cromwell close to many of Vegas’ most popular attractions, but the hotel also boasts 188 beautifully appointed rooms and suites, exceptional hospitality, the first-ever restaurant by chef Giada De Laurentiis and three party-oriented experiences by nightlife visionary Victory Drai. Among the other things you’ll find at the resort is a 40,000-square-foot casino with 66 table games, nearly 440 slot machines, a high-limit room and a reserved gaming room. The lobby is reminiscent of an old world parlor with bookshelves lined by leather-bound tomes. Bound by Salvatore, the lobby bar, features the signature cocktails of world-renowned bartender Salvatore Calabrese — including the bubbly Cromwell Fizz, The Breakfast Martini and the espresso-infused Keep Me Awake Bro and Never Say Goodnight. Plus, there is a centralized bar and lounge called Interlude. De Laurentiis, the well-known author and television personality on the Food Network, is behind the 10,000-square-foot eatery Giada. It’s situated on the second floor and has a patio that showcases breathtaking views of the Strip and Fountains of Bellagio. Her Italian cuisine embraces her birthplace of Rome while blending in some Californian influences. Signature dishes include lemon spaghetti, eggplant rollatini, marsala herb chicken meatballs and lemon ricotta cookies. Giada is open for breakfast, lunch and dinner. North Las Vegas resort Texas Station offers hospitality and Texas-sized entertainment options, including the Dallas Events Center, a 2,000-seat concert venue, as well as the South Padre nightclub, an 18-screen movie theater and a 60-lane bowling center. Texas Station boasts the same friendly atmosphere of its sister Vegas establishments (Boulder, Palace, Santa Fe and Sunset Stations — plus, Green Valley Ranch and Red Rock Casino, Resort & Spa), but combines it with the charm, attitude and flavor of the Lone Star State. At just over 47 acres with a 125,000-square-foot casino, elbow room is plentiful at Texas Station. A wide variety of gaming options — more than 2,000 slot and video poker machines, 27 table games, a 486-seat bingo hall and live keno — make the resort ideal for those looking to challenge lady luck. Several full-service restaurants — Austins Steakhouse (winner of numerous Las Vegas best steakhouse awards), Texas Star Oyster Bar, the Grand Cafe, a giant buffet and a number of other eateries — provide great dining. Enjoy a drink and piano music at the A-Bar before your dinner or stop by the Martini Bar afterward and have one of their metropolitan cocktails with a Western flavor. South Padre plays host to live musical acts and has a dance floor. Play billiards in the Splitz Bar. The Dallas Events Center, meanwhile, hosts big-name entertainment. The entire family will enjoy the 18-screen Regal Cinemas, which offers everything from Hollywood blockbusters to independent films in plush comfort and state-of-the-art dazzle, with stadium seating and THX stereo. And did we mention the 24-hour, 60-lane bowling center that features Cosmic Bowling on Fridays and Saturdays? There’s a lot to do deep in the heart of Texas. You had better get moseying along, partner, or it’s going to pass you by. Great food, a casino with a 574-seat bingo hall, lots of bars and amenity-filled rooms — it’s no wonder adults love Boulder Station. Plus, kids enjoy the movie theater and a supervised play area. One of several Station Casinos resorts in Las Vegas, including Sunset, Palace, Santa Fe and Texas Stations as well as Green Valley Ranch and Red Rock Casino, Resort & Spa, Boulder Station has its own distinct look, feel and identity despite being part of a growing family. Located on Boulder Highway, just minutes away from the Strip and downtown, this establishment truly has something for everyone. First and foremost, the casino, a prodigious 75,000-square-foot gaming floor surrounded by restaurants, bars, a gift shop and attractions, draws an even mix of locals and visitors. The resort’s wooden floors and brick columns display a rustic, comforting appeal that makes guests feel like they’re at home. Dining choices are plentiful, ranging from the bold Baja flavors of the Cabo Mexican Restaurant to the Feast Buffet, a smorgasbord of freshly prepared dishes including waffles and flambé for dessert. For a more quiet and intimate atmosphere, diners can enjoy fine steaks at The Broiler or Italian food at Pasta Cucina, which offers thin-crust, stone-oven pizza and pasta specialties like manicotti Florentine and Tuscan angel hair. The Railhead, a centralized lounge, offers dancing and live music performances. The Kids Quest youth activity center presents a fun and dynamic playground for children to explore while their parents enjoy the hotel’s adult diversions — like cocktails at the Havana Lounge, Brewer’s Bar or KIXX. And the 11-screen Regal Cinemas complex is one of the finest movie theaters in town, with comfortable seating, spacious auditoriums and a friendly staff aiming to make any night at the movies an unforgettable one. In addition, guests will appreciate the recently remodeled rooms. Boasting a boutique hotel feel, each one features elegant wall coverings, fixtures, rich wood furnishings and custom-designed artwork. Among the amenities are a built-in closet, a computer desk, pillow-top mattresses and a 40-inch plasma television with cable service. The bathrooms also boast granite countertops and new light fixtures. Like its sister establishments, Boulder Station sets its own standards and surpasses them. Small wonder this family is one of the proudest in town. Get a taste of Mexico at the Fiesta Henderson. Located in Henderson, just minutes from the Las Vegas Strip (with easy freeway access via the I-95 and 215 Beltway), this colorful resort provides a festive detour — and sprawling south-of-the-border restaurant — to señors and señoritas alike. Parking at the Fiesta Henderson is a breeze thanks to the four-story, 1,500-space parking garage, as well as both VIP and valet parking. Once inside the casino, try a game of all-paper bingo in the 300-seat bingo room or play one of 1,600 slot and video poker machines. There are also 18 different table games and an eight-seat keno lounge. A state-of-the art, 137-seat race and sports book entices sports fans, offering lines on all major sporting events and horse races. The Fiesta Henderson provides plenty of chances to eat, drink and be merry, with several restaurants and bars dotting the two-story property. Flair bartenders serve up authentic margaritas with style at Amigo’s Mexican Cantina, while diners can’t help but overindulge on the array of multicultural selections available at the Festival Buffet. For a more elegant dining experience, go to Fuego Steakhouse. Along with several fine cuts of meat, you’ll enjoy fresh seafood ranging from salmon to Australian lobster tail and Alaskan crab legs. Café Fiesta serves up great food around-the-clock — everything from French toast and omelets to shrimp cocktails and giant pork egg rolls. Rounding out the food options is a food court comprised of Starbucks, Villa Fresh Italian Kitchen, Subway and Fatburger. Looking for entertainment? Many of the latest Hollywood blockbusters are showing in the 12-screen movie theater. Live music can be heard on weekends in the Cerveza Cantina. Two other bars — the Coco Loco and the Sports Bar — also dole out spirits all night long. To top it all off, accommodations at the Fiesta Henderson are both comfortable and affordable, with great views of the city or the mountains and access to the property’s pool and Jacuzzi. Service-oriented and family-friendly, the Fiesta Henderson offers everything you need so that your stay — whether it be for one night or several nights — is filled with fun. If you’re traveling for business or leisure, the Mardi Gras Hotel & Casino offers both comfort and a fine location to make your trip a pleasure. The hotel is located three miles from McCarran International Airport, and free airport transportation is available. Plus, the Mardi Gras Hotel & Casino is only a half mile from the heart of the Las Vegas Strip, and there’s a Las Vegas Monorail station in the vicinity that provides coverage along the southern end of Las Vegas Boulevard. Conventioneers will also have easy access to the Las Vegas Convention Center, which is only one block away from the hotel. Rooms at the Mardi Gras Hotel & Casino are well-appointed and very comfortable. Starting at 430 square feet, they are approximately 25 percent bigger than most standard hotel rooms. Each room comes with one king, one queen or two queen beds. Among the amenities are a coffee/tea maker, a cable television with pay-per-view movies, an iron and ironing board, a mini refrigerator and a hair dryer. Bathrooms have a combined shower and tub. In addition to free wireless internet access, guests can make complimentary local phone calls. Food is never a problem at the hotel, thanks to the Bon Temps Café. The on-site full-service restaurant cooks up delicious, affordably priced meals for breakfast, lunch and dinner. Snacks are also served in the 24-hour Mardi Gras Bar, which offers karaoke on Saturdays and daily happy hour specials. Visitors who want to soak up the sun will discover a landscaped pool, along with a Jacuzzi and sun deck. The Mardi Gras Hotel & Casino is also home to a 24-hour casino filled with a variety of video poker and slot machines.